Canadian-born flying ace Raymond Collishaw (1893–1976) served in Britain’s air forces for twenty-eight years. As a pilot in World War I he was credited with sixty-one confirmed kills on the Western Front. When World War II began in 1939, Air Commodore Collishaw commanded a Royal Air Force group in Egypt. It was in Egypt and Libya in 1940–41, during the Britain’s Western Desert campaign, that he demonstrated the tenets of an effective air-ground cooperation system. Flying to Victory examines Raymond Collishaw’s contribution to the British system of tactical air support—a pattern of operations that eventually became standard in the Allied air forces and proved to be a key factor in the Allied victory. The British Army and Royal Air Force entered the war with conflicting views on the issue of air support that hindered the success of early operations. It was only after the chastening failure of Operation Battleaxe in June 1941, fought according to army doctrine, that Winston Churchill shifted strategy on the direction of future air campaigns—ultimately endorsing the RAF’s view of mission and target selection. This view adopted principles of air-ground cooperation that Collishaw had demonstrated in combat. Author Mike Bechthold traces the emergence of this strategy in the RAF air campaign in Operation Compass, the first British offensive in the Western Desert, in which Air Commodore Collishaw’s small force overwhelmed its Italian counterpart and disrupted enemy logistics. 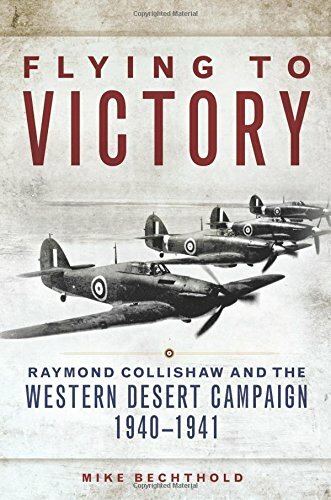 Flying to Victory details the experiences that prepared Collishaw so well for this campaign and that taught him much about the application of air power, especially how to work effectively with the army and Royal Navy. As Bechthold shows, these lessons learned altered the Allied approach to tactical air support and, ultimately, changed the course of the Second World War. Able Seaman Carl Carlson with one of the hull plates of H.M.C.S. QU'APPELLE which was pierced by a German shell during an action in which H.M.C. Ships QU'APPELLE, SKEENA, RESTIGOUCHE and ASSINIBOINE sank three German armed trawlers. England, 16 August 1944.